Some people have been wondering how they are going to shoot their ELE video. If you have a plan, script or song but you can't film it because you haven't got the right equipment/actors/instruments/location/etc think about it again. I don't know for sure but I can make a guess that the Whedons and Ms Tanchareon and their associates are looking for original ideas above the latest technology/steady camera work/fancy locations/etc. While it won't hurt to have special effects or expensive costumes don't be put off if you can't get them. It's supposed to be enjoyable for you as well as your audience. If you are stressing about it then take a break and come back to it again. A webcam will do - use what you have available. Most of all, if you have an idea then try and capture it with whatever you have. Don't fret if it isn't quite what you envisioned in the end. It could be better than you hoped for. If you're not sure about video editing think about writing something that can be done in one take. This might make for more initial work (how many takes will it take for you to say 'Evil League of Evil' right!) but it saves time later. There is lots of information on the Internet about how to shoot videos and how to upload them, so what are you waiting for? Surely you can do better than my Evil Twin! ELoE Application Competition - enhanced picture and extended deadline. Life is a learning process and the thing I've learned this week is that if you want people to enter a competition don't make the task too difficult! With this in mind I'm publishing another picture today, plus some clues. And extending the deadline. What if you've already entered? Well if you have already entered, thank you for doing that! And of course, you may enter again. I'm going to email you all with the new pic so no-one is disadvantaged in any way. This picture is so clear, I really hope you will be able to see them all! The last one might be tricky, but it shouldn't be impossible, especially for a Browncoat (yes, that's a HUGE clue!). Ok, so what's the new rules? I will email an Application Form to you (as featured in Act I) for you to fill in. If you also want to post a video entry on YouTube, Seesmic or elsewhere then please send me the link and I will use it as part of the assessment. 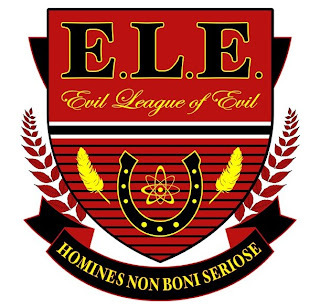 EvilWorldofHiglet will then assess your application in a special episode of 'The Evil League of Evil Applications Office' to be publicly available on YouTube. The winner will also be announced here on the blog. So, there we go. Lessons learned. Rumour has it that there is going to be another video released on YouTube tonight by Evil WorldofHiglet. I wonder what that could be about....? 1 Tim Street: Why Do Some People Get Millions of Video Views? Evil League of Evil - Applications now open! Hear that sound - something's on the rise! And it could very well be the sound hundreds of new Vimeo and YouTube accounts being created. The Evil League of Evil have finally announced that applications are open! Is that enough fun yet? After several people (yes, more than 1!) 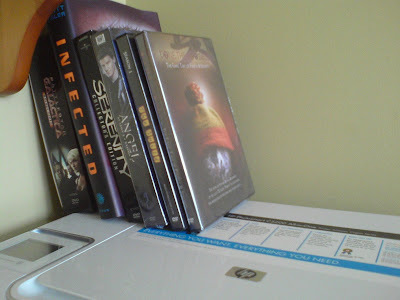 have said they can't make out more than 2 of the DVDs I've taken a picture from the set (haha - 'set') to make it a bit easier. Plus, I have reviewed the book on this blog and it isn't one of The Softwire books by PJ Haarsma (because they are in use). If you still can't get them all I'll add some more clues, but basically they are all from my collection. If you win EvilWorldofHiglet will assess YOUR application to the Evil League of Evil in a special episode! 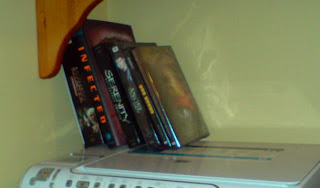 Watch Act V and tell me the names of the book and DVDs in the background, on top of the printer. Send your entries to worldofhiglet at gmail dot com* before Friday 26th September 2008. If you want you can include a little about why you like Dr Horrible so much and even the name of your Evil Character and I will mention you on the blog. It couldn't be more simple! In the event of a tie (or more than 1 entry!) I will use a random number generator to determine the winner. 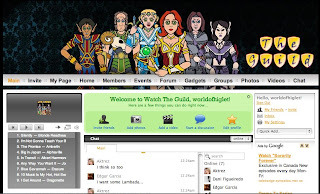 Breaking news - new website for The Guild! Wow - I was not expecting this! The new Guild website is now live and is AWESOME! Totally. Felicia had Tweeted that a new site was coming but this....Well, just go and see, register, friend me and then let yourself go. 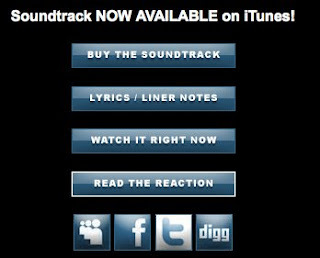 There's forums, chat, music - everything you might want. I'm positively giddy, and at this time of night (morning!) that's saying something. And, oddly enough, it made me feel really proud. For no reason. I had no input into any of it and yet...Ok, I'll stop now. Go visit. Dr Who talks like a Pirate? No, not really, but lots of people are today! Surprisingly, Google is not entering into the spirit, but are you celebrating today? Doctor Who Season 4 - on CBC tonight! The final, Act VI, will be finished and on YouTube this weekend, so I hope you all enjoy that. There's been a mixed response to the competition, so I'll be publishing an enhanced picture tonight, so look out for that. If no-one gets all of them I will do the selection from the entries I had. Don't you want Evil WorldofHiglet to assess your entry to the Evil League of Evil? Good ole WorldofHiglet, sometime Blogger and fangirl. Geek and wouldbe writer. In the past several months we've shared ups, we've shared downs, we've shared wobbly bits in the middle (though that last one could just be me). But one thing we've not shared is....names. Yes, I've been at pains to keep my real name away from just about everything. That is about to change. Yes, I know I have done guest posts before, like the interview with PJ Haarsma on Whedonage. The difference with these new posts is that was actually paid to do them and I have published them under my real name. This is a big deal for me, so if you want to have a look, maybe leave a comment (pretty please), head over to ArtCulture.com. The lastest one is a groovy interview with Jensen from Gallery 1988 in LA. They have just had the second 'Crazy 4 Cult' exhibition featuring up and coming artists and a whole lot of cult movies. The Opening Party was hosted by Kevin Smith and Scott Mosier and the art is eye-popping. You may carry on about your normal business. The last geek bus home will continue it's meandering and marginally entertaining journey. The world will still turn. But something has definitely changed. I'm sure I've done the right thing. Haven't I? Scary Dollhouse News? And - Competition Time! There was a ripple in The Force last week. The news that Dollhouse, the new series by Joss Whedon starring Eliza Dushku (who is also an executive producer) has been put on a two week break. There was an interesting piece about why we should be nervous on TelevisionWithoutPity, which lists are the reasons why a break could spell trouble. While it's useful list I'm going to disagree. I don't think there is any reason to panic at all. Why can't we panic? It's Fox, after all....! AS I said, it's an interesting list but let us not forget a simple truth. This is a new show. Joss has already re-written the pilot so it is more immediately accessible, and now he wants to concentrate on getting the writing polished for the rest of the episodes. One thing we know about Joss is that he is the boss - and the writing is EVERYTHING. He's been working flat out for months now with Dr Horrible (yay!) and Dollhouse and I think the surprise is that he didn't call for a writing break earlier. Even with experienced and talented writers on the team Joss will want everything nailed down before shooting starts for these last episodes. Even in Dr Horrible there was no ad-libbing from the cast at all - what is written is what is shot. It won't do anyone any good speculating impending disaster and, in the end, it could put people off watching the show or giving it a chance. I think it's an excellent sign that there is a break, that's my story and I'm sticking to it. And now [drum roll] a new competition! We all love Dr Horrible and many of us are waiting, with little or no patience, for the Evil League of Evil to announce open season on applications. In the meantime I have been amusing myself (and a select few) with producing a webseries based around the ELoE's Application's Office. The penultimate episode, Act V, was released last weekend and the final episode in this series will be out by next weekend. Due to popular demand (well, two people who are not related to me!) there will also be a blooper/extras reel. And this is where the COMPETITION comes in. If you win EvilWorldofHiglet will assess YOUR application to the Evil League of Evil in a special episode! * Please note: I am not going to spam you or pass on your email details, I hate spammers as much as you. Why I'm taking a chance and launching a competition on my blog, with a real (virtual) prize! A volunteer team of meteorologists and journalists are live tweeting throughout the Hurricane. Not a bot.Live feed from the eye of the hurricane. 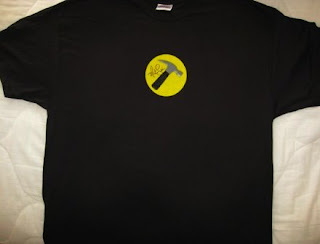 But the new auction from Kids Need To Read has an official Captain Hammer teeshirt signed by none other than the Hammerman himself, Nathan Fillion. It's ok, I'm not going to do another big rant about how great Mr Fillion is, how his new series, Castle, has been picked up by ABC and will be airing in 2009, how wonderfully he plays Mal, Caleb, Captain Hammer or any of his other roles. Nope, not me! All the details are on the Kids Need To Read website, and the auction is on eBay with a closing date of September 13th - so best hurray! Dr Horrible and The IT Crowd - a match made in (geek) heaven! See, Twitter tells you things. Like the makers of The IT Crowd, a wonderful sitcom by Channel 4, want to use Dr Horrible outfits in Season 3. And Dr Horrible, via Twitter, has now said they are in talks...this is very exciting! But many, many thanks to all the people who have viewed so far (nearly 1,700 views in total). The responses have been really positive and it makes it worth it :) There have been calls for a blooper reel and yes, I have plenty of footage for that, so when the other Acts are up I'll turn my attention to all those fluffed takes currently clogging up my hard disk. Yep, waste not, want not.